My grandfather used to say, “I don’t understand what people who speaks other language say but I can tell you what kind of people they are only listening to their words.“ I’ve never thought how right he was before doing one of the first readings for this class. It is amazing how many researches and studies have found exactly the same thing. My grandfather was uneducated ,gfamrerm , who grew up in a small Bulgarian village in the mountains. His natural intelligence told him language, behavior and way of thinking are all connected. Language Can Shape The Way You Think remains one of my favorite articles from this class. Being a non-native speaker, using English for studying and living in an English speaking country have proved to me this is true. Frequently I have trouble with English because my mind forms my thoughts in a very different way than the way I need to find the right wording for specific things. Every time when I translate something I face the different way of thinking behind the two languages. Studying a third language here makes it even more interesting. I think if we look closer to the language spoken in Kenya we can better understand some of the issues Kenya has and we can learn much more about this country and its culture. After reading about Kenyan language, I identified three aspects of Kenya related to its languages: Kenya’s history, tribalism and attitude toward life. English was inherited from Kenya’s British colonial past. Even today, English is the language of choice in business, academics and social set-ups in Kenya. This fact is related with Kenya’s history. By knowing English is the official language we already know that it was colonized by England . There is second official language in Kenya and it is Swahili (also called Kiswahili). 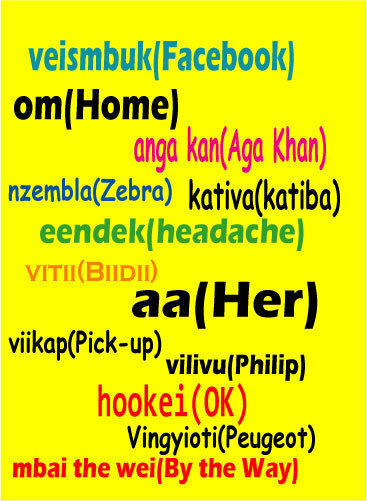 Swahili is a unifying African language. Even illiterate Kenyans know some basic Swahili. The purest form of Kiswahili is spoken along the coast where native Swahili people live. Swahili is one of the most common African languages and it is spoken in many countries other than Kenya, such as Tanzania, Burundi, Uganda and Zaire. Having too different official languages has resulted in a third language which is combination of them. Sheng is a commonly spoken slang in Kenya’s capital, Nairobi. It is a mixture of Swahili and English, with a sprinkling of other indigenous languages. In fact, Sheng is more than just slang – it’s a lifestyle, especially among the urban youth who, today, are more fluent in Sheng than in the purer forms of Kiswahili. Speaking about Indigenous people of Kenya in class, gave me the idea to write about the indigenous issues and indigenous people of Kenya. As the guest lecturer on Thursday suggested, South Africa can be related to the so called Kansas Nation ( United States, Australia, Canada and New Zealand) who have similar histories connected with indigenous people and their rights. Only this part of Africa can be related to it because it was under English colonization. That is why I think it is important to talk about the Indigenous Languages in Kenya. Kenya’s ethnic languages are spoken mostly in rural settings and in homes where all members belong to the same ethnic group. The most dominant of the indigenous languages are Kikuyu, Dholuo and Luhya. Kikuyu is the language of the Kikuyu people, Kenya’s largest ethnic group. It is closely related to the Embu, Mbeere, and Meru languages spoken by neighboring communities in the Mount Kenya region. The Kikuyu language is widely spoken in Kenyan towns. Additionally, members of other ethnic groups also speak it. This is particularly true in business situations. Since Kikuyu people run the majority of Kenya’s businesses, it is common to find people conducting business in the Kikuyu language. As a result, other business people have had to adapt and learn Kikuyu too in order to do proper business. (Stay tuned for my Blog for more information about Kenyan Indigenous people.) -Authors note. The third connection of language is life philosophy. Do you remember Lion King.? Yes, you for sure know this song. It is called Hakuna Matata. Not many people actually know this is not a made up phrase, but it is a phrase in Swahili. The film’s production team claims it picked up the term from a tour guide while on safari in Tanzania. It was then developed into an ideology that, along with the seemingly antithetical value of duty to the monarchy, is central to the moral content of the film. 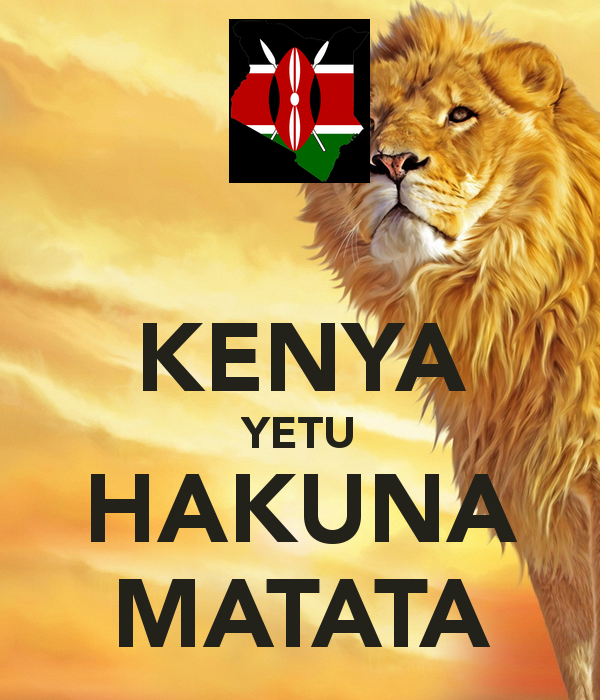 Even though the idea for the usage of this phrase came from a safari in Tanzania, Swahili is also spoken in Kenya and this phrase is also used there. It can be translated literally as, “There are no worries.” Its meaning is similar to the English phrase “no problem.” As a bicultural, I definitely can see how sayings, phrases and proverbs in one’s language represent the cultural understandings and beliefs of this nation. I think that this phrase and life ideology can be related to some extent to the African culture in general, including Kenyans.